We have three different approaches where electronic security can minimise accidental damage from touching of open displays by the public. 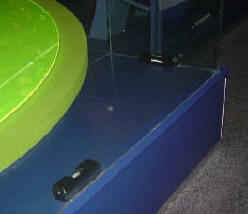 These are: an infra red detector, a "curtain" barrier created by a portable PIR and a proximity alarm ATS. In all cases these systems work much better as the second layer of security behind some form of marking like a white line on the floor, rope barrier of course or slightly raised plinth. 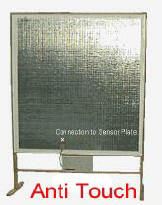 Provides area protection within a room upto 5m (typical of a historic home open to the public). A portable passive infrared detects movement in the zone. It is battery operated. Product was developed in conjunction with the National Trust. If someone wanders into the zone, they hear a loud double door chime. 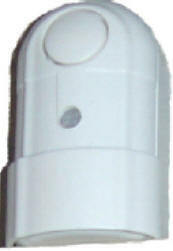 A unit commonly fitted to the ceiling (or floor). A curtain of protection can be narrowed or tilted to protect the desired space or object. Units can be set up to protect a non linear space. Two units (painted black) protect a right angle. The plinth provides the first layer of protection. The ultimate in Anti Touch. A capacitance solution for use where for example the art is displayed on a plinth or protection field requires exceptional control (e.g. dining table display) or where the other two less expensive solutions are not practical (e.g. a costume).